Background: The Pekin duck, bred from the mallard (Anas platyrhynchos) in china, is one of the most famous meat duck species in the world. However, it is more sensitive to heat stress than Muscovy duck, which is believed to have originated in South America. Objective: This study aims to uncover the temperature-dependent proteins of two duck species using comparative proteomic approach. Methods: we performed the comparative proteomic analysis based on the previous methods and focused on α-enolase, an enzyme previously shown to change in response to high temperatures, but in a species-dependent manner. We also performed a semi-quantification assay of α-enolase mRNA in these two duck species. Results: Gene expression levels and enzymatic activity for α-enolase (ENO1) were both upregulated in Muscovy ducks and downregulated in Pekin ducks. 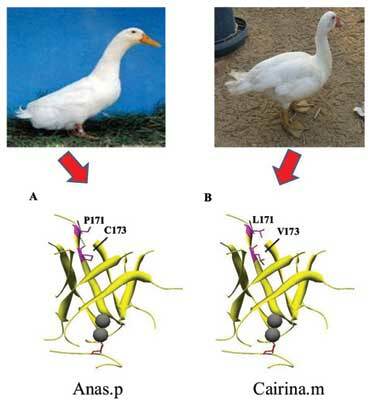 A comparison of cloned amino acid sequences showed 21 base pair differences in the ENO1 between Pekin and Muscovy ducks, corresponding to five different amino acids between protein sequences. Sites 171 and 173 were polymorphic for Pro/Cys in α-enolase in Pekin ducks and Leu/Val in Muscovy ducks, respectively. Conclusion: The moieties L171P and V173C were located at the top of β-sheets depending on the three-dimensional structure of α-enolase, which may have a role in guiding the substrate to the enzyme catalytic domain. Keywords: α-enolase, duck, ENO1, protein evolution, proteomics. Keywords:α-enolase, duck, ENO1, protein evolution, proteomics. Abstract:Background: The Pekin duck, bred from the mallard (Anas platyrhynchos) in china, is one of the most famous meat duck species in the world. However, it is more sensitive to heat stress than Muscovy duck, which is believed to have originated in South America.